In 4-quart Dutch oven or 12-inch skillet, heat oil over medium-high heat. Cook parsley, thyme, onion and chile in oil about 3 minutes, stirring frequently, just until onion is soft. Stir in bacon. Cook about 8 minutes, stirring occasionally, until bacon is crisp. Drain fat, reserving 2 tablespoons; discard remaining fat. Stir vinegar into bacon mixture; cook until evaporated. Stir in tomatoes and reserved bacon fat. Heat to boiling; reduce heat. Cover and simmer 20 minutes, stirring occasionally. Meanwhile, cook and drain pasta as directed on package. 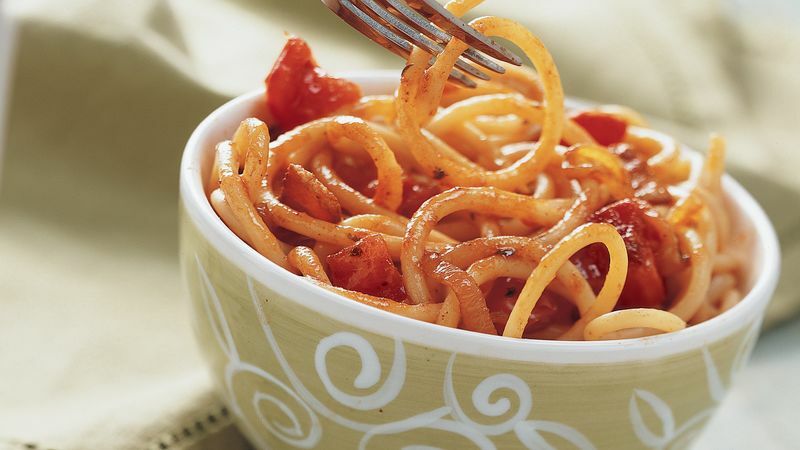 Add pasta to tomato mixture. Cook over high heat about 3 minutes, tossing gently, until pasta is evenly coated. Two 28-ounce cans Italian-style pear-shaped tomatoes, drained and chopped, can be substituted for the fresh tomatoes. Bucatini is a long hollow noodle that resembles a drinking straw. It originated in Naples and the word bucato means, "with a hole." You can use spaghetti for the bucatini.